Advice for military veterans undergoing a medical examination or assessment for their War Pension. An erudite and concerned disabled military veteran Mrs S... contacted me to say she had spent what little strength she has on research and has additional information that was useful in her dealings with the Service Personnel and Veterans Agency (SVPA) (www.veterans-uk.info) and ATOS Healthcare (www.atoshealthcare.com). She has provided me with some of her correspondence in the hope that her work can help others. It should be noted that there are thousands of veterans. Most are time served and thankfully not disabled. Some are in receipt of a war pension. This page is written for disabled military veterans. Veterans are looked after by the SPVA. It is the SPVA who write to veterans about medical reviews etc. The administration for all war pensions awarded prior to 2005 is conducted by the SPVA. However, since 2005, the SPVA review medicals have been handled by ATOS Healthcare, under a contract awarded and managed by the DWP (www.dwp.gov.uk). Extracts of the Contract have been published on this website. All the medical reports have been produced by staff in the employ of ATOS Healthcare. The quality of a number of these medical reports is regarded as "dubious" at best and proven "unsound" in the case that this website highlights. It is important to stress that the procedures for pensions awarded before 2005 is different from the procedures for pension awarded after 2005. Since 2005 there is now a new and totally different system in place for all new disabled veterans. It should be noted that a War Pension is not a benefit, and is only awarded to military personnel who have been medically discharged from service due to illness or disability. You can click on a date to link to the document published on this page. 2007 Transcript BBC News Article Mark Daly exposes UNUM. June 2010 Summary By Mrs S... ATOS HEALTHCARE OR DISABILITY DENIAL FACTORIES - research summary. June 2010 Report By Mrs S... ATOS HEALTHCARE OR DISABILITY DENIAL FACTORIES - full detailed report. 20 November 2011 Summary By Mrs S... The Truth Behind Welfare Reforms (distributed November 2011). 5 December 2011 Summary By Mrs S... Atos, Unum and the DWP (distributed December 2011). 12 February 2012 Report By Mrs S... The Total Failure of ESA is Confirmed (distributed February 2012). 20 March 2012 Article Daily Mail British people are committing suicide to escape poverty. 22 June 2012 Article By Mrs S... Disability Denial Factories working well in the UK. 29 June 2012 Article By Mrs S... ATOS, UNUM & the DWP - the planned destruction of the Welfare State. 18 July 2012 Article By Mrs S... Welfare Reform Tyranny direct from the USA. 3 August 2012 Letter By Mrs S... To Prof Malcolm Harrington. 1 September 2012 Article By Mrs S... Disability Denial Factories working well in the UK - UPDATE. 27 October 2012 Article By Mrs S... Government use might of American insurance giant to destroy UK safety net. 4 February 2013 Article By Mrs S... Backbench Business Debate re Atos Healthcare and the WCA. You can click on a date to link to the item of correspondence published on this page. 15 February Letter To SPVA Noting apologies and raising additional concerns. 18 June Comments From Atos Medical Staff "It's really tough to qualify for ESA." 21 June Letter From DWP Apologies and consolatory payment. 23 June Letter To DWP Response. 5 August Letter From Tribunals Judiciary Outside remit. 9 August Letter To Tribunals Judiciary Response. 16 August Letter From Professor Harrington CBE Accepts report as evidence in WCA Independent Review. 23 August Letter To Chair DWP Select Committee Suggestions for improvements. 23 August Letter From Citizens Advice Scotland Report added to knowledge base. 3 September Letter To SPVA CEO Provides access to report. 5 September Email To Disability Alliance CEO Summary follow up to research report. 12 September Email To Parliament DWP Select Committee Diligence regarding contract. 14 September Letter From SPVA No further action required. 17 September Email To SPVA Response to 14 September letter. 25 October Memo To SPVA Chief Executive Rejecting the previous response. 3 December Memo To All Response to Professor Harrington's Review of WCA. 24 January Letter To SPVA Response to previous SPVA letters. 31 January Memorandum To Work and Pensions Committee Response to DLA reform consultation. 7 February Letter To Minister for Disabled People Informing of the situation. 23 February Letter From Prof. Malcolm Harrington Principles are right but system contains flaws. 27 April Letter To Minister for Employment Informing of the situation. 9 May Letter To DWP Chief Medical Adviser RCN refuse to accredit Atos nurse training. 14 June Letter To Minister for Defence Personnel Informing of the situation. 20 June Letter To General The Lord Dannatt Informing of the situation. 23 June Letter To DWP CDMS Correspondence Manager Informing of the situation. 29 June Letter To House of Lords Seeking redress for the disabled. 29 June Letter To Mr Stephen Barclay MP Seeking why the Minister answered in generalities. 16 August Letter From the Minister For Defence Personnel Welfare and Veterans Providing a more detailed reply. 10 September Letter To Professor Harrington Welfare Reform - Redress For The Disabled. 14 September Letter From Rt Hon The Lord Strathclyde Forwarding concerns to Minister. 20 September Letter To: Mr Stephen Barclay MP DLA assessment exemptions. 24 September Letter To Lord McNally Human Rights and Civil Liberty abuses: DWP and Atos Healthcare. 4 October Letter To Baroness Meacher Welfare Reform Bill. 7 October Email To Baroness Hollis Welfare Reform Grand Committee contribution. 10 October Email To SPVA War Pensioners Cold Weather Payment. 23 January Letter To the Rt Hon Andrew Robathan MP Chronically and profoundly disabled War Pensioners. 29 February Report To various The Total Failure of ESA is Confirmed. 19 March Letter To Air Vice-Marshal Ross Paterson OBE Response to previous letter. 19 March Letter To Dr Rachel Perkins Chair, Equality 2025 Planned destruction of the welfare state. 20 March Article Daily Mail British people are committing suicide to escape poverty. 31 March Letter To Prof Malcolm Harrington Total failure of ESA is confirmed. 5 April Letter To Air Vice-Marshal Ross Paterson OBE SPVA Investigation. 14 April Letter From Air Vice-Marshal Ross Paterson OBE Atos Healthcare has improved. 21 April Letter To Air Vice-Marshal Ross Paterson OBE Atos Healthcare has improved. 12 May Letter To Stephen Barclay MP Welfare Reforms/War Pensioners. 28 May Letter To Air Vice-Marshal Ross Paterson OBE Disabled Veterans. 1 June Letter To Air Vice-Marshal Ross Paterson OBE Disabled Veterans. 2 August Letter To Stephen Barclay MP Welfare Reforms. 3 August Letter To Stephen Barclay MP Welfare Reforms. 3 August Letter To Prof Malcolm Harrington Thank you. 10 August Letter To Goff Daft, DWP Concerns at evidence given to Minister. 15 August Memorandum By Anne E Dyson GP Personal evidence. 21 August Letter To Stephen Barclay MP Welfare Reforms. 7 September Letter To Stephen Barclay MP Welfare Reforms. 20 September Press release Aylward Folds. 1 October Letter To Stephen Barclay MP Welfare Reforms. 23 October Letter To Prof Malcolm Harrington Atos and the PIP contract. 18 November Letter To Stephen Barclay MP Welfare Reforms. Mrs S... wrote a report on her experience and her research. A printable version of the report is available (www.whywaitforever.com/dwpatosveteransprint.html). Please use your browser to change the text size to improve legibility. If your browser has a print preview feature, you may want to choose the size e.g. "100%" or larger instead of "shrink to fit". This research report is dedicated to the author and designer of www.whywaitforever.com/dwpatos.html, whose quality website encouraged me to conduct further detailed research. Contact via email and telephone confirmed that this designer undertook this work whilst diagnosed with a terminal and inoperable primary brain tumour, knowing that he probably had less than 12 months to live. His courage, concern for others and remarkable strength of character are indeed humbling to behold and it was my great privilege to have contact with this very remarkable man and courageous man. Please be advised that this report is the result of 9 months research and was written over a period of time, between February and June 2010 as health permitted, hence various references in date order throughout the text. I am most grateful for the contents of the annual government reports, written by His Honour Judge Robert Martin, and I hope the detailed information contained within this report may be considered to be of some assistance to his work and the work of other Tribunal Chambers. This research was undertaken voluntarily, as a private initiative, and was not commissioned or funded in any way. INTRODUCTION: I am a retired health professional and a War Pensioner, medically discharged from service in 1984. I originally trained in the NHS as a cardiac technician from 1970-72 and, when qualified, I opened and ran the cardiac care department at the new Lister Hospital, in Stevenage, from 1972-78. I then joined the RAF Medical Service in 1978, where I was further trained in clinical Neurology and Audiometry, and I qualified as a Physiological Measurements Technician at RAF Wroughton. Once qualified, I was posted to the RAF Central Medical Establishment in London, where I worked for the head of RAF Medicine, Air Vice Marshall Brian Kelly, together with other visiting consultants, until my medical discharge in 1984. In 1983 there was a planned national rail strike and I was unable to travel to my unit. Therefore, for the duration of the rail strike, I was temporarily detached to the Institute of Aviation Medicine, at RAF Farnborough, Hants, where I lived in married quarters and where my husband was stationed. The medical research at the Institute was classified and I am, therefore, not at liberty to disclose in detail how I contracted my illness. Suffice to say that, whilst on detachment, I contracted a very rare virus infection, which subsequently manifested itself as a post viral Polyarthritis that required treatment at RAF(H) Halton on three separate occasions. QED: The enforced detachment to the Institute, due to a national rail strike, ended my medical career. VOLUNTARY WORK: Since I lost my medical career I have involved myself with voluntary work, at both local and national level, and I have been the Director of three charities. Many years ago I co-founded the Camberley Branch of Arthritis Care and was short-listed for a national award for my work with young people with the condition. Having moved to Cambridgeshire, I was a member of the Executive Board of my local district theatre, I was the co-signature for the charity chequebook and I held the office of Honorary Secretary to the Executive Board. In 2003 I marketed the theatre for its silver anniversary season, which became the most successful season on record with all shows sold out. I was also mentor to large numbers of performing arts students over the years with the Special Education Department, Cambridgeshire, refering complex needs teenagers to me for work experience with very positive results. It was my failing health that obliged me to leave the theatre community in 2004. Since leaving the theatre I have helped people with writing a variety of letters and documents, have re-written three dissertations for students and continue to help others to write formal reports. Quite clearly, self-pity is not my style. My integrity has never before been in question until an unhappy meeting with a young health professional, in the employ of Atos Healthcare, in December 2008. It is safe to presume that I was incensed when I learned that my integrity had been doubted. Despite increasing pain and disabilities over the years, as predicted at my medical discharge, I remain fiercely independent. I prefer to be kept busy and I have never felt the need to "adopt a disabled lifestyle" as reported in December 2008 in a totally bogus medical report by the Atos Healthcare "disability analyst." Integrity and honour remain the values I live by. Given my shocking and disturbing experience with a young doctor from Atos Healthcare, and following additional detailed research, I am obliged to expose my findings about this totally unacceptable government funded medical agency. BOGUS MEDICAL REPORT: It is totally unacceptable to me to have my integrity challenged by the actions of a young man who knowingly wrote a bogus medical report, claiming to have conducted a detailed medical examination when, in reality, no medical examination whatsoever took place. Due to this young man's dishonesty, my War Pension was not only not increased but it was changed from an interim award to a FINAL award, which means no further deterioration claims will be considered and it was presumed that both my doctor and I had made false statements for my ultimate financial gain. This was totally unacceptable to me and deeply offensive to my doctor. I have invested a great deal of time, when physically well enough to undertake research, in order to confirm my suspicions regarding Atos Healthcare. Given that my findings may potentially impact on the welfare of countless thousands of other genuinely sick or disabled people, I decided to bring this research evidence to the attention of someone in authority. BOGUS REPORTING IMPACTS ON CHILDREN: Prior to revealing evidence regarding my own personal experience, and that of other disabled adults, I believe I should report my recent experience on behalf of a profoundly disabled 5-year-old little boy, who is the son of a friend. My friends, who have minimal income, applied for DLA for their son to allow them access to a Motability car to permit easier transport. The little boy was born with a profound and very obvious physical disability in that both his legs are very nearly at right angles to his torso. Clearly, the boy is physically unable to walk, run or climb stairs and this situation can never improve. It is certainly one of the most severe disabilities I have witnessed in childhood, not unlike some of those afflicted with the Thalidomide tragedy. The DLA application forms required evidence as to why the child was physically unable to climb a flight of stairs and his parents offered detailed evidence, supported by their GP and Consultant Paediatrician. However, the medical report provided by a Physiotherapist from Atos Healthcare, on behalf of the DWP, concluded that the reason why the boy was unable to climb stairs could be attributed to "frequent ear infections" and her report totally failed to mention the child's very obvious and profound physical disability. Consequently, the family's request for DLA was initially rejected, with the Consultant Paediatrician's report being ignored. Needless to say, a strongly worded observational support letter from myself, as a retired health professional, did it seems help to persuade the Appeal Tribunal to disregard the totally bogus Physiotherapist's report and, happily, the family now have access to a Motability car that has greatly improved their quality of family life. CUSTOMER: What is of concern must be what possible pressure was brought to bear to permit a Physiotherapist to compromise her oath of office so seriously to instigate such a bogus medical report? One obvious cause is the employer i.e. Atos Healthcare. The Government is this Contractor's principal health care "customer" and the DWP Contract is in place to justify these measures, given that the Government's priority is to remove as many people as possible from government funded help in order to reduce care costs. TERMINAL ILLNESS: Another very, very disturbing example of the Contractor's abuse of power can be found at a website identified as: www.whywaitforever.com/dwpatos.html, which was designed by a very courageous web designer who is terminally ill with an inoperable primary brain tumour. Despite the diagnosis and very, very frail health, which included the onset of Grand Mal epileptic fits that could not be predicted, this victim of the DWP was still required to travel to distant meetings via public transport, to attend Pathway Meetings, under threat of losing benefit if he failed to attend. He was required to be part of meetings to discuss his possible future return to work - when he had been given a terminal prognosis with less than 12 months to live. Clearly, the indoctrination of DWP staff is very high calibre given the callous and uncaring nature of their approach, even to the terminally ill. This is deeply disturbing and another example of how the DWP and Atos Healthcare choose which parts of the government Contract to adhere to, and which parts to totally ignore. The Contract clearly identifies claimants with a confirmed terminal illness as being EXEMPT from this scrutiny, yet the author of this website was repeatedly threatened by the DWP with losing his benefit if he refused to attend. The consequences of such threats, together with the physical effort employed and the anxiety created, by risking public transport when so frail and suffering with frequent GM fits, can only be imagined and, in my clinical opinion, is a form of medical abuse by the DWP and this Contractor. TOTALLY UNACCOUNTABLE: Further research has identified the fact that the medical examinations conducted by Atos Healthcare staff have no public accountability for medical practise. Safeguards are in place for all patients in the NHS, and the private medical sectors, to protect anyone who may suffer at the hands of an unacceptable medical professional. However, all these agencies have confirmed that the medical staff from Atos Healthcare "are not in our remit" and, apart from the DWP Medical Services Contract Management Team, who are administrators with no medical qualifications, there is no public protection for the victims of Atos Healthcare medical staff, despite protests from the Service Personnel and Veterans Agency (SPVA) who try to suggest otherwise. Atos Healthcare describe their doctors as "disability analysts" whose responsibility is to the company and not to the sick or disabled people they meet in the course of their work. Consequently, the sick and disabled victims examined by company staff are not considered to be patients or clients but 'customers' and the disabled members of the public, examined by the medical staff from this company, have no safeguards in place and are, therefore, vulnerable and open to exploitation until someone manages to expose this dangerous situation. DISABILITY DENIAL FACTORIES: Detailed research has confirmed that this medical assessment system, employed by Atos Healthcare, is based upon a successful and very similar medical assessment system in place in America, as demonstrated by an insurance company identified as UnumProvident (US). This company, in a California class action lawsuit in 2002/03, was identified by the Judge as operating "disability denial factories" and fined US$31.7 million. MEDICAL EVIDENCE RESISTED: Further research has revealed testimony from doctors working for the company employed as disability analysts, as well as former staff doctors who resigned from Atos Healthcare, as they were not prepared to compromise medical ethics for a profit margin to the distinct disadvantage of the sick and disabled claimants they were expected to examine. Their evidence confirms frequent staff meetings wanting details of average time taken for patient reviews, and writing the reports, but the company never discussed patient/claimant welfare. Doctors at Atos Healthcare are rewarded by the quantity of medical assessments undertaken, with some doctors earning as much as £5,000 per WEEK. In his annual report as President of the Appeal Tribunals, released in July 2008, Judge Robert Martin revealed that the numbers of appeals had increased, from 217,000 per year to 229,000. Indeed, Judge Martin was insistent about the fact that the "same problems and errors are repeated year after year, with no sign that anyone takes any notice of feedback from Tribunals". In relation to DLA, out of a sample of 365 successful appeals, Atos Healthcare supplied medical evidence in 302 cases. Hence, the Contractor conducts most disputed medical reports. Tribunal Chairs criticised medical reports from Atos that "did not coincide with reality" and considered that it was the fact that Tribunals took time to question appellants about their history, care and mobility needs which led them to a different conclusion from the decision makers. In relation to the personal capability assessment of incapacity for work, Tribunal Chairs told the President that a major problem was an even greater likelihood than with other benefits for both examining doctors and decision makers to refuse to believe evidence given by the claimant. So, the medical evidence from the claimant, their GP and medical consultants, who know the claimant well and have monitored and treated their health over time, can be resisted when their evidence is accepted as expert testimony in every court in the land. This is how the Government will dramatically reduce care costs. Why is this permitted? The continuing frustration with the total failure of the DWP and ATOS Healthcare to produce consistently reliable evidence and decisions shines out in Judge Martin's report, and there was a likelihood that the situation would get worse in the coming months and years. And so it did. The new report by Citizens Advice Scotland has confirmed that 69% of people claiming the new ESA benefit are actually refused this help and the medical assessment by Atos Healthcare is totally unworkable. Of course, the DWP continues to dismiss all evidence against this company as politicians wax lyrically about Atos Healthcare's 'medical expertise' used as a priority for assessments claiming that this assessment is one that has "...been developed in partnership with a number of organisations, including those representing disabled people." Dr Jake Branton explained more: "Atos actively discourages its doctors from calling GPs or requesting more information because it takes too much time. Doctors are only allocated 25 minutes per claimant and, unfortunately, most of each 25 minute appointment is taken up with the questionnaire from Atos, leaving little more than a couple of minutes for physical checks in most cases. There is simply not enough time to verify a patient's claim." Dr Chris Johnstone is a GP in Paisley whose initial work helped to shape ESA Policy and he is one of the experts referred to, by various politicians, as they attempt to justify this dangerously inadequate medical assessment process from this private company. He says: "I have no problem with a rigorous medical assessment done in a supportive fashion. But I think if you have a slipshod one done, as it appears anecdotally, that's unfair for the people going through the system. It feels like it is done inappropriately and it's almost being done to save money rather than look after people." VICTIMS: It is indeed regrettable that some dishonest people undoubtedly played the system to obtain benefits to which they are not entitled. However, a War Pension is not a benefit, and I believe that the reason the administration of War Pensions was altered in 2005 was to place all older veterans at a disadvantage, to resist funding future medical deterioration claims, and to place us all as potential victims of this government medical tyranny in an effort to greatly reduce increasing government care costs for older disabled veterans. Atos Healthcare was awarded the latest DWP Contract in September 2005. Make no mistake about it, as I do believe that all sick and disabled people, who must endure a medical by this Contractor, are indeed potential victims. What is even more sinister is that this so called medical assessment system was introduced under a veil of fairness, and the British public fell for the rhetoric amidst massive press and media coverage. Yet the grossly exaggerated press and media hysteria totally overlooked evidence that identified bogus DWP claims number no more than 2% of the entire DWP annual budget but, under this new system, all long term sick and disabled people are treated as suspected criminals and we do appear to be presumed guilty until proven innocent. In reality, review medical 'examinations' with this Contractor are a harrowing and distressing experience and it's time this was exposed as the unacceptable face of government cost cutting. COSTS: Very conveniently for the Government, a system that employs medical staff who willingly agree to create dubious medical reports will no doubt reduce government care costs in the short term. However, given the growing annual costs of the Appeal Tribunals service, one needs to wonder just how much saving is identified when the costs of using this Contractor are already in excess of £80 million per annum, plus the costs of the increasing numbers of Appeal Tribunals? The distress and subsequent trauma suffered by the victims of this Contractor, whose only 'crime' is to invite financial support when sick or disabled, remains cause for concern but impossible to quantify. GMC CONCERNS: The General Medical Council is also unhappy with reported concerns regarding increasing numbers of dubious medical reports, impacting on the lives of thousands, which detract from the reputation of the medical profession that has always been held with such high esteem within the UK. At least some of the medical staff employed by this Contractor clearly do abuse the public trust, without fear of reprimand. However, the GMC have confirmed that, as a company, Atos Healthcare "...have total immunity from medical regulation." Indeed, the Healthcare Commission confirm that doctors carrying out work for government departments are specifically exempt from regulation under The Private and Voluntary Health Care (England) Regulations 2001 and Care Standards Act 2000. This surely permits unacceptable medical reports to be presented, without fear of reprimand, it is cause for alarm and is something that the British public do not yet know and may explain a great deal. I am wondering if the Justices in the Appeal Tribunals circuit are also aware of this shocking reality? The GMC have assured me that they would still wish to be advised of any named doctor who breaches patient trust, and they will be sent details of my experience after I have received the Appeal decision. The GMC have also confirmed that all doctors remain subject to good medical practice, regardless of whether they are the registered health care professional for a patient or a disability analyst representing a private company, contrary to the claims from Atos Healthcare. UNREALISTIC: The total lack of public accountability of Atos Healthcare, as confirmed in the government Contract that covers 500 pages, means that the only redress available is for victims of this company to report named doctors to the GMC or to report other health professionals, such as Physiotherapists, to their professional body. This total lack of public accountability is dangerous nonsense and few people, who are themselves already sick and/or disabled, would have the strength, the desire or the courage to undertake such a massive and unrealistic expectation, especially when it has already been established that a GMC investigation can take up to three years to complete. This unrealistic expectation permits the Contractor a distinct advantage as confirmed by the Contract, which guarantees the opportunity for the sick and disabled people of this nation to become nothing more than government statistics. This is the danger of a welfare system, in contract with a private company, that now holds the balance sheet to be of much greater importance than the welfare needs of our sick and disabled people. POWER & AUTHORITY: Now that the UK government is using finance as the only priority for welfare, instead of the welfare needs of the sick and chronically disabled people who depend on this service, it is guaranteed that countless numbers of vulnerable people will suffer whilst Atos Healthcare remain in a singular position of power and authority. The usual common courtesies, respect and human kindness expected from all health professionals towards their patients - or claimants - have been exchanged for a balance sheet. Human Rights are displaced and the need for compassion, and especially the dignity of the patient/claimant, is totally disregarded. The sick, the disabled and now even the dying are victims of this systematic medical abuse of power, and intimidation and bullying tactics are used to silence anyone who attempts to expose this government funded medical tyranny. Indeed, in the Appeal Tribunals Report of 2009, it is confirmed, "...appeals are twice as likely to be successful if the applicant appears at the appeal compared to when they don't." So, this statement doesn't appear to hold out too much hope for those of us who are too ill, in too much pain or too disabled to risk travel, which places the most profoundly sick and disabled people at a distinct disadvantage, including older War Pensioners. Can this really be considered to be justice? INCREASING DISABILITY: The SPVA administer my pension and, until recently, I had not been in touch with the SPVA for over 20 years. As my health deteriorated, and the physical disabilities dramatically increased over time, I requested a review of my War Pension and, in 2006, a visiting doctor - freelance and former RAF doctor - conducted a very thorough medical examination in my home, and in the presence of a chaperone, and confirmed the significant physical deterioration. My pension was then increased from a 20% disability to a 60% disability as an Interim award, which accepts that the diagnosed condition may deteriorate further. In 2006 the experienced visiting doctor strongly advised me to claim again within 12 months due to the expected and continued "savage onslaught" of my condition. His detailed medical report confirmed all statements offered by myself and my GP as being true, and my GP's assessment of my disability levels as being accurate. QED: my doctor and I have no need to make bogus deterioration claims. DETERIORATION: As predicted at the 2006 medical examination, over time my condition continued to deteriorate significantly but much faster than in previous years. Due to this serious and painful deterioration, and with the full support of my doctor, in August 2008 I requested another medical review of my pension, as advised by the previous visiting doctor in 2006. For the 2006 review my GP had suggested that I presented as being 60% disabled for daily living. The subsequent medical review report confirmed my GP's opinion, in a designated box within the printed report form, and my pension was increased to acknowledge the serious increase in disability. For the 2008 review it was my GP's opinion that I presented as being 80% disabled for daily living and at times, when I am confined to the sofa for days, I am 100% disabled due to the serious and more rapid deterioration in my diagnosed condition, which she felt was to be expected. It had been necessary to increase analgesics to include Diamorphine for pain control, and I was confined to the sofa for days, usually every week, due to the increase in pain and disabilities that now also seriously compromised my entire spine and chest wall, which can impact on breathing. Little did I realise that my integrity was to be challenged for no other reason than the fact that my disabilities had continued to increase, but the Government did not wish to fund the deterioration. Funding is now the only priority for the UK Government and the obvious increasing disabilities of a veteran will be resisted to prevent increases in care costs. INTIMIDATION: Subsequently, a totally unacceptable young man, claiming to be a doctor from Atos Healthcare, eventually visited me at home in December 2008. However, due to unforeseen circumstances on the day, it wasn't possible to have a chaperone present for this review medical, and I now wonder if the young doctor's conduct would have been different if there had been another witness present? Indeed, the young man claimed to be a visiting doctor whilst steadfastly refusing to offer any acceptable ID. produced a medical report that was a total work of fiction and copied, verbatim, extracts of the medical evidence from parts of the previous 2006 detailed medical examination. BOGUS CLAIM: For the 2008 medical review, all the provided and very detailed medical evidence was resisted, and the fact that I re-submitted a claim 18 months after the previous pension increase appears to have alluded that I was making a bogus claim, despite the fact that I have a confirmed diagnosis, which presumes on-going and increasing physical deterioration over time. To this effect the SPVA's decision, following the totally false 2008 medical report, not only limited my pension to remain at a 60% disability but it was changed from an Interim award that allows for further deterioration claims, to a FINAL assessment that effectively prevents any further deterioration claim and risks forfeiture of pension if pursued. Yet this conclusion was for a confirmed diagnosis of a medical condition that can only continue to deteriorate over time. This is another example of the dangers of administrators making decisions that they are medically unqualified to make, and presumes that a rapid health deterioration must be bogus. SPECIALIST: When I reported my concerns to my GP I was advised that she had: "...lost count of the numbers of my patients who have been broken following a meeting with a staff member from this Company." I then decided to challenge the shocking and bogus medical report and finally, 20 months after my initial application, the Appeal Tribunal medical was eventually conducted on 29th April 2010 at my home by a visiting Consultant Rheumatologist, who was not in the employ of Atos Healthcare. RAFA REP: However, I am constantly being warned by my RAFA Representative that my pension can be reduced or removed, thus adding to the significant stress and distress I have endured since this all began. Why must any veteran be so intimidated by their own Representative when a previous detailed medical examination had confirmed my failing health, increasing disabilities and predicted that the physical deterioration would rapidly continue over time? SUPPORT OR INCREASED STRESS: Indeed, it seems that my RAFA Representative is reluctant to believe me as the only advice he gives me is to repeat that, if my claim is bogus, I could lose my pension (after 25 years?) - which funds my home - and this from a man whom I've never met and is meant to be supporting me. I have no doubt that this is due to the 2008 totally bogus report from the Atos Healthcare doctor that claimed I had "adopted a disabled life style." Despite the very detailed medical evidence provided for the Appeal, strongly supporting my testimony, it seems that the medically unqualified RAFA Representative would appear to believe the Atos Healthcare doctor, and clearly this is cause for concern if he is meant to represent me at any future Appeal Tribunal. EVIDENCE RESISTED: With reference to Atos Healthcare, it is very sinister to note that priority will be given to medical reports from this Contractor (Atos Healthcare) and so the medical evidence provided by the claimant and their doctors will be resisted, as evidenced in my case. Indeed, evidence in writing from Atos Healthcare management now confirms that, for the usual face-to-face medical interviews "..the examining practitioner would not have access to a customer's NHS medical patient history." Therefore, no matter how much medical evidence is provided by the Claimant, it will be totally ignored. Atos staff are instructed to resist all medical evidence from both the claimant and their doctors, including consultants/specialists, hence my insistence that this government medical assessment system is nothing more than systematic medical abuse to reduce government costs. One must therefore challenge why claimants/veterans are obliged to provide large amounts of detailed medical evidence for any application which will then be totally resisted? Atos Healthcare can and do avoid the usual scrutiny by claiming that their doctors are, in fact, "disability analysts" and are not responsible for the care of the claimant/victim/veteran as they do not offer diagnosis or prescriptions etc. CASH OFFER: I can also confirm that, once this Contractor had realised that I could not be silenced, they then presumed that my silence could be purchased with the offer of an 'ex-gratia' and 'without prejudice' payment for £200, for a submitted postage invoice for £31.07, to "acknowledge the stress and distress" I had suffered. It seems that Atos Healthcare management have little comprehension of honour, presumed my integrity was for sale, and were a little stunned when I refused to accept the offered excessive payment. A cheque for refunded postage costs to the value of £31.07 was finally received on 23rd April 2010. To date it has not been cashed. It is interesting to note that the cheque is funded by the parent company, Atos Origin, with the company cheque stating that payment is "for and on behalf of ATOS ORIGIN IT SERVICES UK LIMITED - Medical Services Expenses" and the compliments slip that arrived in the same envelope with the cheque is from Atos Origin and not Atos Healthcare. CONTRACT ABUSE: Atos Healthcare is so confident with their position of authority that they break the DWP Contract on a daily basis because they can. Who is actually going to stop them? For example, the Contract requires the Contractor (Atos Healthcare) to advise the Authority (SPVA) within two days if they receive any complaints from applicants/claimants/war pensioners. Yet I was exchanging correspondence with this company for in excess of 9 months and at no time did they contact the SPVA until I advised that I felt it was time to bring my experience to the attention of the SPVA, who administer my War Pension. The Government Contract also confirms that claimants with a diagnosed terminal illness do not need to attend Pathway Meetings, so why do the DWP insist that they do, and there are several groups of illnesses that require the Contractor to provide a specialist medical opinion, with specific medical expertise in that field of medicine, and both progressive cancers and musculo-skeletal difficulties are included. SPECIALIST OPINION: Given that this Contractor was in breach of contract when sending a novice staff member to conduct my medical review, instead of a medical specialist, I am at a loss as to why I have been placed under such stress for very nearly 18 months and this will be pursued in the fullness of time, health permitting. However, given that the vast majority of claimants have no access to the Contract, this fact is not well known and, since this Contractor has no public accountability, the public never will. VEXATIOUS COMPLAINTS: The constant suggestion by the DWP, the GMC and the British Medical Association (BMA), all claiming that any medical assessment that can reduce income is open to "vexatious complaints", appears to have been the general excuse for the DWP to effectively remove all responsibility for the care of our sick and disabled veterans and fellow citizens. Therefore, any and all protests regarding the abuse of patients by this Contractor are routinely dismissed, presuming them all to be "vexatious" and an emotional reaction to being identified as a scrounger being forced back to work. There is nothing in place to prevent the Contractor creating as many bogus medical reports as possible, the general public have no idea of the shocking consequences of a so called medical review by this Contractor and, once they have been adversely affected, the general consensus will be that victims will be ignored or not believed. RESEARCH EVIDENCE: Research evidence collected, using limited resources, has clearly demonstrated that Atos Healthcare and the DWP totally ignore the government Contract conditions by, for example, failing to inform the SPVA/Authority of a serious complaint from a War Pensioner who was also a retired health professional, insisting that a terminally ill claimant must still attend Pathway Meetings or risk forfeit of benefits, by attempting to resist the award of DLA for a profoundly disabled child and by failing to provide a suitably qualified doctor to conduct my review medical. STATISTICS: Atos Healthcare is very confident that they can silence most complaints. Dr Kitchen, at the SPVA, confirmed that Atos claim that there are only 24 reported "letters of complaint" from every 7,000 people medically examined by Atos Healthcare and, indeed, these are figures willingly published in government reports about this Contractor and have marginally increased from earlier claims that there were only 7 reported complaints per 7,000 examinations. However, Atos Healthcare, who has repeatedly demonstrated that they are economical with the truth, exclusively provides these totally unsubstantiated statistics. I challenge these statistics as, judging from the wealth of complaints about this company available via the Internet, the significant and increasing numbers of successful Appeals and my distressing personal experience, it seems likely that most complaints are handled by the Contractor without admission to any Authority or inclusions in any statistics provided for the DWP. PRESSURE: Both Atos Healthcare and the SPVA attempted to silence me so one must be concerned for large numbers of other genuine victims of this company, who are unlikely to have the necessary skills and confidence to challenge bogus medical opinion. They also may not be too experienced at writing formal letters and documents. Therefore, I believe that this system is very, very sinister and smacks of desperation from a Government that has bankrupted this nation, and now the sick and disabled people of this country are easy targets and are being used to reclaim some of the nation's lost wealth by using bogus medical reports to resist helping those most in need. Clearly, this DWP government Contract had cross party support as Gordon Brown, when Prime Minister, insisted that 1 million people would be removed from the old Incapacity Benefit and David Cameron claimed that the numbers of people in receipt of DLA would be reduced by 25%. These claims made good press copy but how do they know that, in advance, without a guaranteed system to abuse sick and disabled people and to reduce government care costs without challenge?? DANGEROUS COMPUTER QUESTIONNAIRE: The Contractor's parent company, Atos Origin, is an IT company and dependency on a computer-generated questionnaire does appear to be exasperating a serious problem at the Atos Healthcare medical assessment centres. Indeed, all computer-generated questionnaires are notorious as they cannot allow for common sense, for medical variances within an identical diagnosed health condition and because administrators will be making judgements from questionnaire conclusions about medical conditions for which they are totally unqualified. Doctors may complete the computer questionnaire in interview with patients/claimants, but administrators calling themselves Decision Makers take decisions regarding benefit, war pensions etc based on conclusions dictated by the questionnaire. An example of the problem is available on all Microsoft Word software: running a spelling and grammar check over a document will produce computer suggested changes. Most are appropriate but some are nonsense, and will be ignored by the writer, who has the skills to know the difference. Clearly, administrators do not have the necessary medical knowledge and skills to overlook nonsensical computer generated conclusions; hence the many and growing numbers of distressed victims of this company. An obvious example are the growing numbers of terminally ill claimants, classed as being fit for work, because they are physically capable of collecting a pen from the floor! This is very dangerous nonsense! CLAIMANT DISTRESS: Do not underestimate the levels of stress and distress caused by staff members from this Contractor, and this increases once a claimant demonstrates the temerity to challenge their authority. Then Atos Healthcare will attempt to apply pressure whilst ignoring the required contact with the identified government Authority. I received a total of four letters, from a variety of doctors from Atos Healthcare and the SPVA, all attempting to defend the original bogus medical report, before the Medical Director for Atos Healthcare finally apologised and acknowledged, via a letter from the National Customer Relations Manager, that the 2008 medical report had "failed to reach professional standards". This insincere apology was an attempt, I believe, to finally make me stop my formal complaint. However, both the MD of Atos Healthcare and the SPVA failed to respond to the identified breaches of good medical practice and breach of medical ethics, as identified in my very detailed complaint. Having belatedly received apologies, from the MD from both Atos Healthcare and the SPVA, they presumed that I would then quietly disappear and await the additional medical assessment prior to my Appeal Tribunal. Yet in all communication they both, constantly, refer to the contents of the medical report that they have been repeatedly told was totally bogus, and the content was a work of fiction. If they refuse to accept my testimony then this matter can never be satisfactorily resolved, and they are both totally resistant to acknowledging the contents of my testimony. They are simply apologising for the doctor's unprofessional behaviour, not for the bogus medical opinion he reported. Perhaps both the SPVA and the Contractor ignore all complaints given that Atos Healthcare are exempt from medical regulation and remain confidant that they can never realistically be challenged? The harrowing experience of patients when attending one of the Contractor's medical centres is reported by the designer of the www.whywaitforever.com/dwpatos.html website, as witnessed when he was required to attend another appointment, despite having a terminal diagnosis and the onset of Grand Mal Epilepsy, as confirmed by a Consultant Neurosurgeon. He reports the following: "The first thing you will notice when you attend a medical examination centre is the atmosphere of menace and oppression. You are asked for identification. My NHS prescription charges exemption card was accepted. You are kept waiting. In my case forty minutes after the time of the appointment was due to start. A very sick young girl arrived five minutes after the fifteen minutes allowed for being late. Her carer was still trying to park. She had struggled to get upstairs on her own. Parking places are not provided. She was treated without compassion. Her appointment was cancelled even though all appointments, by that time, were running at least 30 minutes late. She asked if she could make a new appointment there and then. She was refused. She was told that, not that they could not do this but that they would not do this. She was told to go home and ring the appointment centre. One reason Atos Healthcare was awarded the contract by the DWP was that they claimed to have expertise in IT services. A reasonable person might question why staff who presumably can access a central booking system behaves in such an unhelpful manner? Remember the harsh and unwarranted treatment of the patient is not personal. The staff are only obeying instructions. The staff are told to consider the people as customers not as patients. The staff may not be on the pay scales or conditions that are typical in NHS establishments.....I felt this Kafkaesque process was an unwarranted approach to be used against the dying, the sick, the disabled and their carers. It does additional harm as the patient is lured into a false belief that, as this is a medical procedure, it will benefit the patient. When realisation eventually dawns, disbelief disgust and anger are a natural consequence of seeing ill people kicked while they are down. I was so weak I nearly fainted under the Tube. I was seriously ill for four days. It took weeks to recover my strength because of the actions of Atos Healthcare. Despite complaints and appeals, you may still be ordered to attend "work" meetings. You should reply to each request made in error with an additional complaint. If you do feel strong enough do point out you are the patient not the customer. The DWP is the customer. You are a patient covered by the state duty of care." ( www.whywaitforever.com/dwpatos.html re: DWP ESA Medical Examinations - ESA Medical Examination - Practical Matters refers) NB: The author of this website is terminally ill with an inoperable primary brain tumour. WHY does the DWP actively encourage a private company to abuse such seriously ill patients?? SPVA: The Deputy Head of Veterans Medical Services, from the SPVA, claimed that he would usually have offered me another medical "in these circumstances" but, given that my case was under Appeal, this was not possible. One needs to question how many times this has happened in the past "in these circumstances" from a senior doctor who claimed, at a regional WPC meeting, that he had "no knowledge of any complaints" about Atos Healthcare medicals? Indeed, this doctor seemed a little stunned to discover, from my reply, that I wouldn't permit another staff member from Atos Healthcare into my home and, following extensive personal research, I confirmed that I don't trust the company or any of their staff. RESPECT: The Deputy Head of Veterans Services (Medical) SPVA - in letters written by employed "drafters" - waxes lyrically about his respect and admiration for disabled veterans yet, clearly, he is not military and has little comprehension of a code of honour. He was informed that I intend to alert the GMC to my serious concerns regarding the medical practice of the Contractor's medical staff and his lack of supervision on behalf of disabled veterans. He was not best pleased with my news. Indeed, he continued to avoid answering specific questions relating to my reported unacceptable experience with the junior doctor, who visited my home and compromised medical ethics on behalf of Atos Healthcare and the SPVA. It is interesting to note that this senior doctor has "voluntarily removed" his registration from the GMC Register in the hope, presumably, of avoiding any future responsibility for the consequences of unacceptable treatment by Disability Analysts in the employ of Atos Healthcare. Yet, by definition, the Deputy Head of Veterans Medical Services has a duty of care to the disabled veterans of this nation and one has to ask why he is abandoning this duty whilst the Contractor continues to sabotage the War Pension (WP) deterioration from veterans without fear of redress? This also begs the question as to how many other disabled veterans have been betrayed by the very government department that is meant to support them? Is it not enough that we've had our health, and subsequent quality of life, compromised by service to our country without the need to discover that limiting pensions, and not the welfare of disabled veterans, is now the only priority of the SPVA? CLAIMED REPRIMAND: Following claims from Atos Healthcare that the doctor who visited me had been reprimanded I invited detailed evidence as to the type of reprimand, which was resisted by the National Customer Services Manager, Brian Pepper, claiming that he was prevented from offering confidential information about members of staff and that details had been provided for the designated DWP Contract Manager, whom I then contacted. I had presumed that this latest claim was yet another work of fiction by this company, and it seems I was correct. Two months after my initial enquiry in February 2010, I again made contact with the DWP Contract Manager inviting a reply. An incoming letter from the DWP Contract Manager offered apologies claiming that she was awaiting detailed information from Atos Healthcare, which had not been forthcoming!! STRESS & DISTRESS: Once an Appeal Tribunal has been requested the stress on the claimant increases exponentially, with conflicting information from a variety of Justices being sent to the claimant, who may struggle to cope with such stress when already so ill and/or disabled. In my own case, I have had input from no fewer than 4 different Justices and the Appeal Tribunal was originally confirmed as being planned for November 20th 2009. At the very last minute I received a 'phone call to advise that the Appeal had been deferred again and I was strongly advised to acquire a Representative. I was resistant to this suggestion as my case is predominantly about compromised medical ethics, and the lack of good medical practice, and I failed to see how anyone could realistically represent me without medical training. I finally agreed to obtain help via RAFA but have never met my Representative, whose 'support' revolved around his insistence that the Appeal Tribunal would not be interested in my evidence regarding the Contractor, and he appeared threatened by the fact that I am a retired health professional. PRESUMED AUTHORITY: At the time of starting to prepare this report my Appeal hearing had been altered yet again. Having been invited to permit the Tribunal to take place at my home as, due to serious and variable health limitations I am totally unable to confirm attendance at a distant meeting at some future date, that arrangement was superseded by yet another Judge who deemed, after exclusive consultation with my RAFA Representative, that another medical report was all that was needed; hence more delays. I advised the Appeals administrator of my concerns that my Representative had been consulted, and confirmed arrangements changed, without having the courtesy to consult with me. This man is my designated Representative, not my Advocate, yet he presumes an authority he doesn't have and the Appeals administration appear to think this is the norm. Needless to say, following this, my RAFA Representative has been even less supportive. I have no knowledge of the expected time frame between the proposed new medical review visit and the Appeal Tribunal decision. I also have no confidence that the RAFA Representative will support my claims and concerns, as I am physically unable to attend the Appeal hearing, now planned to be held in London. My RAFA Representative has yet again firmly instructed me that, if the medical review fails to support my deterioration claim, then I should cancel the expected Appeal or risk the removal of my pension altogether. Is this not just another form of an intimidation? It should be noted that it is now over 16 months since my unhappy experience with a staff member from Atos Healthcare and 20 months since I first advised an increase in my pensionable disabilities. TRIBUNAL MEDICAL: The additional medical review for the Appeal Tribunal was conducted at my home, in the presence of my carer, on 29th April 2010 and 16 months after the previous unacceptable medical, conducted by a presumed doctor from Atos Healthcare. This time the visiting doctor was a specialist Consultant Rheumatologist, a high calibre clinician, and I had no problems whatsoever with his conduct or his attitude. As a quality professional he happily produced photo ID on arrival, without being invited to do so, in opposition to the attitude of the doctor from Atos Healthcare who had refused to offer any form of ID, despite being asked to do so on 3 separate occasions. REPORT: The report from the Appeal Tribunal Consultant confirmed that my deterioration claim was genuine. The visiting Consultant had advised me that it was not in his remit to suggest the percentage disability to be awarded despite the fact that, in the 2006 medical review report, the visiting doctor had confirmed that he concurred with my GP and that I had presented as being at least 60% disabled at that time. It is sinister that the medical report forms were changed to prevent any examining doctor confirming the percentage disability presented by examination of the patient - another cost cutting measure by the DWP, presumably following too many confirmed deterioration claims in the past? The new medical report by the visiting Consultant, on behalf of the Appeal Tribunal, was received and not only concluded that my claim was genuine but also described me as a "stoical woman." A copy of the new medical report was forwarded to my RAFA Representative and I then decided that my Appeal Tribunal should now continue at a date yet to be decided. My original RAFA Representative, who constantly placed me under additional stress, was to retire on 28th May and I was allocated a new Representative, with whom I have yet to make contact. Just prior to his retirement, and following a positive medical report from the visiting Consultant, the outgoing RAFA Representative instructed me to request that the Tribunal should still be conducted at my home, to give the Tribunal members the opportunity to meet with me. His attitude had finally dramatically improved since receiving a copy of the new medical report and he now decided to believe me! A telecom was received on 27th May to confirm that the Appeal Tribunal would be listed for 1st July in London in my absence. I requested the possibility of a home visit and I await that decision (as of 27th May). PLEASE CONSIDER: With reference to sick and disabled veterans in particular, together with the growing numbers of injured service members from the on-going conflicts, the Government's reduction of designated medical help and support for the military has been ongoing for many years without too much public interest. As yet another example of able bodied politicians and administrators making decisions for which they are patently unqualified, it was decided long ago to close all military hospitals and the majority of the military rehabilitation units in order, of course, to reduce costs. Consequently, not only was the most designated medical support removed for our military but the NHS was then catastrophically compromised, by re-allocating military medical care to the over stretched NHS. In theory, two wards in some of the larger district hospitals throughout the UK have subsequently been closed to civilians and provided for the exclusive use of the military. In reality, the NHS will use whatever resources are available, hence civilian patients are frequently found on wards that were meant to be for the exclusive use of the military, and vice versa, which stresses all patients both civilian and military. Needless to say, someone, somewhere no doubt patted themselves on the back as an example of saving the Government £millions and, at the same time, demonstrating their total ignorance concerning the very obvious consequences of such a dire choice. Clearly, to a medical professional, it is indisputable that the mental health and well being of patients who are sick, disabled and/or injured in the service of their country cannot be separated from their physical well being and recovery. There are limitless clinical reports confirming that physical recovery can and will be delayed if the patient is stressed, or distressed, and one guaranteed way to distress injured members of the military is to remove them from the familiar security of military life and catapult them into a civilian environment. Being a member of the military is a way of life, not just a job, and this is totally disregarded for medical care to limit care costs, which will be increased exponentially due to increases in recovery time when these patients are removed from all that is familiar. When needing medical care and least able to cope, military patients are placed into a predominantly civilian environment. This isn't rocket science, it is common sense and is supported by clinicians whose opinions will be silenced or ignored. Closing the military hospitals also removed the military medical staff housing, plus support staff, hence it is never likely to be reversed and the NHS will continue to be overwhelmed by being forced to share limited resources with the military. This nonsense also means that military medical staff, dressed in full uniform, are obliged to work in a civilian environment and then they wonder why staff morale is low! Then, just when all available medical resources are stretched to the limit, the Government controversially commits this nation to a war zone that will last for years and guarantees that the numbers of disabled military patients will dramatically increase and the limited allocated resources have been demonstrated to be totally inadequate. CITIZENS ADVICE BUREAU: Prior to the introduction of the new government medical assessments using Atos Healthcare, officials had already been indoctrinated to expect a massive public outcry as countless numbers of people were to be removed from a life on benefit to get them back into the world of work, despite the fact that there is record unemployment. Ever since, no matter what overwhelming evidence has been placed before the DWP regarding the failure of the Contractor to help the sick & disabled people who must use their services, it is simply dismissed as the DWP's only concern is the reduction of care costs. This was demonstrated in the Government's reaction to a major report by Citizens Advice Scotland, whose detailed evidence labelled the new ESA benefit system as being "unfit" and quoting countless examples of distress experienced by profoundly disabled people, with 69% of applicants being found fit to work by the totally unworkable and dangerous computer tick test evaluation system. According to the very detailed report, the new benefits system have caused "misery and frustration" for vulnerable people yet the DWP's response, as expected, was to claim that: "...the assessment is about creating a fairer and more accurate picture of a person's physical or mental condition. This is how claimants can best get the right help and support." These comments were in reaction to the introduction of the new ESA benefit, that replaces Incapacity Benefit, with able bodied civil servants and politicians waxing lyrically about its claimed merits with no concern, and certainly no interest, in examining overwhelming and detailed evidence that demonstrates that the Contractor totally disregards the Contract, leaving sick and disabled people traumatised by their callous and insensitive so called medical assessments. The Government don't want to know and continue to demonstrate that they will not listen. CONCERNS: Despite the identified concerns of the Justices who must consider the evidence at Appeal Tribunals, and identified in every annual report to the Government, Atos Healthcare are protected by the DWP. The abuse of the sick and disabled people of this nation continues, without fear of challenge or reprimand, and a reasonable person could only conclude that this is justified by some arbitrary target set by political leaders. Attempting to reach unobtainable and unrealistic Government targets, in the minds of many, appears to have caused the deaths of at least 400 patients in Stafford Hospital in particular, as recently highlighted by the Prime Minister (PM) when he announced a long awaited public inquiry to be chaired by Robert Francis QC. Now the new Prime Minister has announced hospitals should get rid of "the targets" and get back to decent hygiene and nursing care. Perhaps the new Prime Minister is starting to wake up to the dangers of politicians attempting to enforce targets where health is concerned? Perhaps he will also wake up to the fact that, without the authority of a resident Matron on site, all patients are at the mercy of Medical Administrators, who have a business degree instead of nursing experience. That is why patients die from a lack of basic hygiene and nursing care supervision! Research evidence has confirmed that Atos Healthcare actively instruct their staff to resist all medical evidence provided in support of the claimants, and totally dubious medical reports by the Contractor's medical staff have been demonstrated to be the norm. Indeed, it is easy to confirm that Atos Healthcare constantly breach the DWP government Contract, which is rewarded at an annual cost of £80 million per annum, and the DWP Contract Manager has demonstrated that, indeed, they are totally impotent to challenge the activities of this medical tyranny. SPVA/ATOS COLLABORATION: I eventually received a reply from the DWP Contract Manager, three months after my initial request. She resisted my request for any evidence that the doctor from Atos Healthcare, who had provided a totally bogus medical report, had been reprimanded for his unethical conduct. Despite the claims to the contrary from the Atos Healthcare National Customer Relations Manager, Brian Pepper, the DWP Contract Manager, no doubt, had no evidence of any such reprimand. However, she did enclose copies of a selection of emails between the MD of Atos Healthcare, Dr David Beswick and the Deputy Director of Medical Services for SPVA, Dr Paul Kitchen. As suspected, Dr Kitchen expressed frustration that I could not be silenced and offered considerable support and gratitude to the MD at Atos Healthcare. There was no evidence whatsoever of any concern for my welfare, as a chronically disabled veteran, and Dr Kitchen had emailed all possible letters he was writing to me for prior APPROVAL from the Atos Healthcare MD in the hope that he wasn't writing anything that could cause the Atos MD problems! This from the man whose principal concern is meant to be for the welfare of the sick and disabled veterans of this nation. Quite clearly, the Government's insistence that all government departments must reduce costs includes the SPVA, whose only concern is evidently not to upset Atos Healthcare management. Most interesting is the fact that Dr Beswick, as Medical Director of Atos Healthcare, has persistently failed to personally respond to any of my letters. Indeed, he's concerned with any possible redress from the GMC, as identified in comments via email to Dr Kitchen, and so he refuses to put his opinion in writing. Instead, he prefers to pass his opinions via the National Customer Relations Manager, Mr Brian Pepper. Included in his emails to Dr Kitchen, Dr Beswick confirms his irritation that I am about to refer his staff member to the GMC and he claims that "..she is still looking for blood via the GMC.." and "..the GMC will quote and use every word and phrase we draft, hence my caution." Dr Kitchen offers sympathy and concern to Dr Beswick and confirms that he uses "drafters" to write comforting and supporting letters to the victims of Atos Healthcare to add the "touchy/feely factor" that, he admits, he isn't too good at achieving. Therefore, perhaps the new Government could begin to reduce costs by removing the staff costs of 'drafters' from the employ of the SPVA by requiring the Deputy Director of Medical Services to write his own letters? Even better, for the chronically disabled veterans of this nation, perhaps the Government could employ a Deputy Director of Medical Services at the SPVA who actually expresses care and concern for the victims of this Contractor, who have already served this country to the best of their ability? For the black tie 5th Anniversary Dinner over 100 members and guests celebrated with COHPA at the Armourer's Hall. Mark Bounds, COHPA Chairman from Atos Origin was the host. Professor Mansel Aylward (former DWP Chief Medical Advisor) gave the keynote address and COHPA Board, past and present, were there. Dr Geoff Helliwell (Founder Director) and Greame Henderson of the Department of Health were honoured guests. However, my new very experienced RAFA Rep felt that this sudden and unexpected offer of an increased pension was ".... a remarkable climb down and very, very rare..." to have an increased pension offered so close to a planned Appeal hearing. INTEGRITY: The suggestion that I was dishonest was totally intolerable to me and, given that in the past I have written a variety of professional reports, I couldn't permit this sleight on my character to remain unchallenged as it was a tarnish on my reputation. Now that my pension has been marginally increased, to finally acknowledge the continuing deterioration in my health with increasing disabilities, and my integrity and credibility are restored, I feel confident to offer this research evidence to others. VERY DISTURBING CONSIDERATIONS AND UNRESOLVED ISSUES: Following 9 months of research, and almost 2 years of my life overshadowed by the suggestion that I am dishonest, what is of great concern is the total lack of any obvious repercussions in place to reprimand health professionals from Atos Healthcare who deliberately compromise their oath of office. They knowingly write bogus medical reports to prevent financial help for some of the most vulnerable people in our society, as encouraged by the company at staff training. What systems are in place to protect the public and to challenge these deliberately misleading medical reports, as identified at Appeal, and repeatedly reported by Judge Robert Martin in his annual reports to Government, which are invariably ignored? Or, as I suspect, once the Appeal has been granted and the Claimant is finally vindicated, Atos Healthcare staff simply move on to produce the next totally bogus medical report, without reprimand. What about the anguish and distress the Claimant/Veteran has experienced for months or years due to unscrupulous health professionals knowingly creating bogus medical reports? Where is the serious redress and acknowledgement of what these victims have suffered just to gain access to financial support to which they are legally and morally entitled?? This is surely a national scandal and, I say again, it is at a cost to this country of at least £80 million per annum to fund the DWP Contract with Atos Healthcare, who are identified as the Contractor. The Government must accept culpability for this nightmare it has created. The acknowledgement that a small percentage of dishonest people have enjoyed ongoing financial support from a bogus claim has meant that there is now a witch hunt mentality in place, masquerading as medical assessment. Everyone who is sick or disabled is presumed to be bogus until such times as overwhelming evidence, of illness or disability, is eventually and reluctantly accepted, often via Appeal. The callous and threatening attitude of the DWP is now also apparent with the SPVA, whose concern should be for disabled veterans, and the lack of dedication to disabled veterans is a cause for alarm. I humbly suggest that this is nothing less than a national scandal as it has permitted this medical tyranny to replace medical knowledge and actual concern. The suggestion of bogus claimants has kept the national press fed with exposing stories, which has all added to the public's callous attitude as the able bodied population suffer with high unemployment and jobs being under threat. The mentality that some people are getting handouts to which they are not entitled has led to the most sinister public outcry, actively encouraged by the UK Government. There is now evidence, from published Government committee meetings, that the DWP Committee members themselves are not familiar with the contents of the 500-page government Contract with Atos Healthcare. They don't appear to realise that the Contract confirmed that medical evidence provided by any claimant, including reports from Specialists/Consultants, would be resisted in favour of exclusive acceptance of the medical reports from Atos Healthcare staff members. This shocking Contract offers the private Contractor unparalleled authority, and guarantees that genuinely sick and disabled people of this nation will be traumatised just because they are too ill to work and presumed to invite financial help. The only recorded statistics are those provided by the Contractor, who has demonstrated repeatedly that they choose their words carefully. This is evidenced by Dr Kitchen, of the SPVA, claiming at WPC meetings that he has "no knowledge" of any complaints about Atos Healthcare medicals and insisting that the company only receive 24 complaints for every 7,000 medicals undertaken. That is because the company do not report the complaints, as demonstrated by the fact that I was in correspondence with them for in excess of 9 months and at no time had they advised the SPVA about my complaint. Yet the Contract obliges the company to report all complaints to the Authority within 2 days of receipt. Clearly they don't and, really, why should they? Who is actually imposing any medical supervision on this private company??? The so-called Contract Manager is a joke. They can't possibly offer medical supervision as they are administrators. They are in place to simply quantify statistics presented by the company, which have been easily demonstrated to be bogus. According to the GMC this company enjoys total immunity from medical regulation, which means that the only redress offered to anyone who has suffered such callous abuse by Atos Healthcare medical staff is that they must then deal with the distress of making a formal complaint to the GMC, usually without medical knowledge or support. This is only possible if the victim of this company actually knows the name of the doctor who examined them. Indeed, the GMC advise that most people loose heart given that any GMC investigation can take up to three years to conclude. IT'S TIME TO EXPOSE THE EVIDENCE: Atos Healthcare boast that they employ more doctors than any other company outside of the NHS, but what type of doctors are employed? It would be very easy to expose this government medical catastrophe using high calibre and independent medical staff, not employed by Atos Healthcare, and with the authority of, perhaps, the Lord Justice Carnwath, the Senior President of Tribunals or whomsoever has such an authority. Perhaps retired military doctors would be a good place to start recruiting this small emergency medical army, and this could only be successful if carried out WITHOUT WARNING to the Contractor. A team of doctors, and other health care professionals, should descend upon Atos Healthcare medical assessment centres in the UK, including the SPVA for the older veterans, without notice, and choose at random at least 100 staff members to examine their last 100 medical reports. Check the percentage of their reports that have supported claimants when compared to the percentage rejected and, of those rejected, compare the medical examination reports of Atos Healthcare staff with what will be significant supporting testimony from GPs and/or consultants. I can guarantee that the unprofessional and arrogant novice doctor who visited me in December 2008 was very experienced at writing totally bogus medical reports. So too I suggest was the Physiotherapist, whose bogus report prevented a profoundly disabled young boy from obtaining the help to which he was entitled. At best the Government has been blinded, as most politicians are similar to the general public and presume, wrongly, that all medical staff will be honourable and are, therefore, incapable of choosing to write misleading reports. Medical staff are like any other group of people, and there are good and bad in them all. It's time to stop the damage and expose this national scandal to protect the hundreds of thousands of genuinely sick and disabled people of this nation from further trauma. DWP COMMERCIAL DIRECTORATE: Correlating a document of this size takes time, and references must be checked and enclosures found. I hadn't anticipated any more correspondence regarding this lengthy battle but, on June 23rd, a very long and detailed letter arrived from the Correspondence Manager of the Commercial Directorate Medical Services, DWP. In other words, this was the formal reply from the Contract Manager division of the DWP in response to my previous letters written months ago. Contained within the six pages of A4 stationary, Mr John Murphy offers profuse apologies but not because Atos Healthcare had permitted a staff member to attempt to intimidate a lone disabled woman, then wrote a totally bogus medical report. Throughout this lengthy document it is clear that Mr Murphy is repeating information provided by Atos Healthcare that, unfortunately, was a long way away from the reality of my experience. Throughout this document this Correspondence Manager unreservedly supports Atos Healthcare and still fails to acknowledge anything from my complaint. He even justifies the fact that the company attempted to buy my silence with an offer of £200. Mr Murphy rejects any suggestion that the medical report provided by the visiting Healthcare Professional was in any way bogus, yet he is himself medically unqualified, and presumably he believes that my doctors and I have lied? No doubt the SPVA and Atos Healthcare are breathing sighs of relief with a presumption that a belated minimal increase in my pension will now stop this as yet unresolved serious complaint. However, the sudden and unexpected increase in my War Pension totally fails to acknowledge almost 2 years of incredible additional stress and anxiety, which has taken its toll on my health, and could have been avoided if I had originally been visited by a specialist doctor as required by the contract. Atos Healthcare breached the contract by failing to advise the SPVA that I had raised a formal complaint and by failing to provide a specialist opinion for my review medical and, as such, they have a lot to answer for. This failure will be pursued in time. Indeed, in order to prevent any such distress being afforded to any other veteran, I will suggest that Atos Healthcare staff should be prevented from undertaking medicals on this nation's disabled veterans in the future. No doubt my suggestion will be ignored, just as the Government have continually ignored all detailed annual reports from His Honour Judge Robert Martin, when President of the Appeal Tribunals. On-going conflicts have present day service members being killed or injured, with daily reports being exposed by the national news, so let's hope that the new coalition government may have different ideas of how to commit British Forces. Clearly, the nation's concerns are with the injured servicemen/women, and all possible help and support should be given to them and their distressed families. Yet, having already served this nation, our sick and disabled older veterans also deserve much better consideration than presently offered by the SPVA, Atos Healthcare and the DWP. Given the influence of this private company, and the public money invested in this seriously flawed so called health evaluation system, it is likely that the sick and disabled people of this country will continue to suffer at the hands of Atos Healthcare staff, who demonstrate unlimited power but lack medical accountability, as afforded by their principal customer i.e. the DWP/UK Government. I salute the work of everyone involved with Help for Heroes, whose efforts have raised additional £millions to support our injured service men and women returning home from the front. However, this concentrates the mind as, if the military hospitals hadn't been closed, Help for Heroes wouldn't need to exist or their funds would be used for extras instead of vital essentials. NB: AH contract recently extended to 2015 to assess all DLA claimants. Since this report was originally completed and distributed, in June 2010, further information has been brought to my attention, hence the need for additional editing. In a letter to a dying man, the Manager of the DWP CMMS department has now confirmed in writing that the DWP never have audited/monitored the contract between the DWP and Atos Healthcare, contrary to claims by successive Prime Ministers and Ministers, who constantly reassure the House and the British public. In her letter to Mr B..., Hilary Brierley confirmed that: "...the Department has not exercised its contractual right to access for purposes of auditing Atos Healthcare's compliance with its contractual obligations." However, there have been many meetings to confirm "performance targets". Someone should explain to this woman the difference between a contractual right and a contractual obligation when dealing with a £100million government contract. I confirm this report is being used as evidence by Professor Harrington for his WCA independent enquiry. QED: It's now confirmed that the £100 million per annum contract with Atos Healthcare never has been monitored/audited by the DWP. In loving memory of Eileen Nearne, a WWII hero betrayed by her country. ".never underestimate the power of persistence." dated between 22nd Jan - 5th February 2010  as eventually supplied via Contract Manager. 2)  Is Labour abolishing illness? The author wishes to thank the parents of the disabled child, highlighted in this report, for their kind permission to expose their experiences within this document. Grateful thanks to Dr Stephen Hall for his assistance with the compilation of this report and the author further acknowledges technical support from Mr Guven Dalsar, together with the information contained within the many websites visited during detailed research over initial 9 month period. NB: UNUM change their name over time and were previously known as "First Unum" and "UnumProvident". This detailed evidence report is offered to members of the House of Lords as a contribution to the delayed debate on Welfare Reform, now planned for September 13th, and was prepared at the personal invitation of noble members from the House. As a retired Healthcare Professional I have invested in excess of 12 months of my time, health permitting, to investigate the relationship between the American insurance corporate giant UNUM Insurance, the Department for Work & Pensions (DWP) and Atos Healthcare (AH). AH is the private contractor engaged by the DWP to conduct the medical assessments of the chronically sick and long-term disabled population of the UK, who are in receipt of disability benefits, yet this company is not regulated by the Care Quality Commission and so the public have no protection. The parent company, Atos Origin – another foreign corporate giant – have been awarded several significant government contracts, including the very lucrative IT contract for the 2012 Olympic Games, that the government ensured was awarded as part of "fair and open competition." By 2005, following copious numbers of successful legal cases throughout the USA, the California Department of Insurance Commissioner, John Garamendi, stated that "Unum Provident is an outlaw company. It is a company that has operated in an illegal fashion for years..." By 2007, the American Association for Justice identified Unum Provident as "..the second worst insurance company in the US. "(5) Therefore, given this company's proven record of sustained misconduct, one must surely enquire why they were ever permitted to be involved with the welfare of British citizens on a statutory basis. Following the statement by the American Association for Justice in 2007 Unum Provident Insurance once again changed its name and is now known as Unum Insurance. Unum Insurance deny culpability for the past history of the company and, mysteriously, the majority of the evidence of past wrongdoing by Unum Provident Insurance has disappeared from the public domain, including the transcript of a BBC News report, from 2007, happily rescued from obscurity by researchers who predicted that the UK was at risk of adopting a copy of the American healthcare system, funded by insurance. With the latest press release from Unum Insurance, announcing that they are about to flood the UK market with mass marketing for income protection insurance, it looks like this is about to become a reality. Mark Daly, presenter: But, there are still dozens of bad faith cases and allegations outstanding against the company on both sides of the Atlantic. Despite all of this Unum had senior executives sitting on key government working groups last year, and has provided detailed memorandum on transforming the benefits system. (The government also awarded grants worth £300,000 to Unum's research centre in Cardiff. See transcript below). Mark Daly, presenter: The BBC has discovered internal documents revealing that Unum believes it is driving Government policy. The Department for Work and Pensions refused to comment on Unum's past. The government's devotion to its main priority, which is a dramatic reduction of the welfare budget, has meant that the concerns of respected frontline charities such as Citizens Advice(1), Macmillan(2), Scope(3), and the Disability Alliance(4) are all seemingly ignored. These welfare organisations, and many others, have collectively expressed serious concerns regarding growing evidence that the disability assessment system, using the Work Capability Assessment (WCA), is flawed and totally unworkable - but the government doesn't appear to be listening. On this basis there is a legal challenge now being undertaken by the Disability Alliance, which may lead to a Judicial Review of the government's welfare reforms. Government concern expressed for the welfare of the chronically sick and disabled people of this nation can only be considered to be totally insincere when employing the services of Atos Healthcare (AH) to assess them. Indeed, the assessment of the long term sick and disabled population by a private contractor with no formal accountability structure, using computer software instead of a detailed physical examination, has been identified as unnecessarily traumatic. (1-4,7) This dangerously flawed medical assessment system uses a computer questionnaire, based on a points system, as recommended by government advisers Unum (Provident). Why does a UK government use a discredited US corporate insurance giant as advisers if not to adopt their system? Successful government propaganda has the able bodied general public convinced that the majority of people in receipt of Incapacity Benefit(IB) or Disability Living Allowance(DLA) are mainly ‘scroungers.' This is despite the fact that all evidence supports the fact that, out of the entire DLA budget, less than 0.5% were bogus applications with 1.5% admin error. (1,4) So why do the other 98% need to suffer other than because the chronically sick and disabled population make very easy targets? Since when is the opinion of medical experts, namely consultants and specialists in the relevant fields of the claimants' disability, unacceptable as a level of a patient's ability to work other than when the DWP need to reduce costs? This is a very dangerous and medically unacceptable precedent, imported from America, that has administrators without relevant qualifications and an unaccountable medical assessment system deciding the fate of often desperately ill and chronically disabled people. Many people in receipt of DLA do work as the award of DLA is unrelated to employment, but they work because they are well enough to engage in employment, and not when forced to look for employment by DWP medical tyranny because Job Seekers Allowance is much cheaper to fund than disability benefits. The DWP's resistance to employing qualified medical administrators has meant that basic grade administrators, known as "Decision Makers", who have confirmed that they lack the ability to interpret medical evidence,(7) have betrayed the sick and disabled people the WCA was meant to protect. The actual disability assessment, as reported by the AH contracted healthcare professional (HCP), is simply one extremely limited opinion derived from a dubious computer evaluation programme, as confirmed in the WCA review by Professor Harrington. (7) The main responsibility of the DWP Decision Makers, as identified in the government contract with Atos Origin Healthcare Services, is to correlate all presented medical evidence including the detailed reports of GPs and consultants, who know the claimant and have actually treated them. Given that the opinions of these medical specialists are accepted in every court in the land, it seems more than reasonable to consider their clinical judgement when deciding if anyone is fit to return to work or to retain disability benefits. However, the Harrington Review (7) confirmed that Decision Makers routinely failed in their responsibility and exclusively accepted the opinion of the contracted HCP from Atos Healthcare, who enjoy "total immunity from all medical regulation" according to the General Medical Council (GMC) and the Care Quality Commission. (6) Because of this, large numbers of chronically sick and genuinely disabled people are being forced to appeal the often alarming decisions of under qualified junior civil servants. (1-4) Welfare agencies now advise that nothing has improved since the Harrington review, hence the challenge by the Disability Alliance. This deeply flawed medical assessment process was identified for a long time by His Honour Judge Robert Martin as President of the Appeal Tribunals. For over a decade Judge Martin's consecutive annual reports constantly identified serious problems with the AH medical assessments (8). Indeed, Judge Martin was insistent that "..the same problems and errors are repeated year after year, with no sign that anyone takes any notice of feedbacks from Tribunals" as confirmed in evidence to the Work and Pensions Select Committee. (9) The evidence confirmed that almost half of the Appeal Tribunals find in favour of the applicant (9) with 70% of claims being upheld for claimants who have representation at the Appeal Tribunal. (10) However, the stress and distress of the need to wait for several months to attend an appeal, in order to retain financial support to which these claimants are morally entitled, is totally ignored. If these were civil cases, generous compensation would be offered as an acknowledgement of the unnecessary distress and suffering caused to the many victims. However, all successful applicants can expect is a reluctant reinstatement of their disability payments, and a back dated award to when they were forced to accept Jobseekers Allowance instead of Incapacity Benefit or, more recently, the new Employment Support Allowance. (ESA) DWP letters to their many victims remain unnecessarily hostile and the enforced disability debt is an ever growing problem. These victims of this AH assessment system loose their disability funding instantly, when they fail to obtain the necessary points at assessment. Yet their DLA payments are already committed to fund their Motability car or to identify the need for essential home care as provided by local authorities. This is brutal, and these consequences appear to be dimissed by the government. With plans to rapidly transfer Incapacity Benefit to the new ESA and DLA being renamed and reallocated to the Personal Independence Payment (PIP), all reference to incapacity or disability is being systematically removed. How can a chronically sick and/or disabled person, who will never again be fit enough for paid employment, be allocated a benefit named Employment Support Allowance when employment is not a realistic possibility? How does this support anyone with a permanent serious illness or profound disability? What happened to welfare? The Minister for Welfare Reform happened to welfare... and it is cause for serious concern that the input of this one unelected official can threaten the welfare provision for millions with care, concern and compassion replaced with a price tag (11). The Minister made his intentions clear in a press interview (11) in 2008 when he claimed that: "... somebody will see a gap in the market and make their fortune" and the article went on to claim that the Minister's idea was to eventually put the private sector in charge of the long-term unemployed. "There will be bonuses for hard cases, and no special treatment of disabled people or lone parents with children at school. "(11) As Minister for Welfare Reform, Lord Freud's past history in finance demonstrates a dangerous lack of any comprehension that a serious illness or chronic disability can indeed be permanent, hence past awards of DLA offered to recipients who, by definition and especially by diagnosis, are profoundly disabled or very ill. These conditions can be exacerbated by exhaustion that often accompanies chronic ill health and serious disability. American style medical tyranny can't make them well, and can't make these genuine claimants fit for work, but constant threats of losing their financial support can and does cause unnecessary distress. Now, the most vulnerable people in our society, already faced with a limited quality of life, are being terrorised by the DWP with the threat of an annual review of their DLA financial support, despite their confirmed and permanent illness and/or physical limitations. Any annual assessment is therefore, by definition, a total waste of limited resources for the vast majority of these people. The sudden removal of DLA may remove a Motability car, or funding for taxis, and may remove the County Council funded home carers as County Councils will not provide carers unless the client is in receipt of DLA for care at the highest level. Any AH assessment is simply one day in the life of the disabled claimant, and cannot be presumed to identify their permanent state of health. Government claims that AH assessments are to establish ability, and not to emphasise disability, whilst demonstrating a dangerous lack of concern for identified consequences is offensive to many. Urgent decisions need to be made to enable justice to be seen to be done. The DWP should employ qualified Medical Administrators, as real Decision Makers, who will comprehend when a given diagnosis means that the patient is far too ill or profoundly disabled to ever consider paid employment. They would even comprehend that the majority of chronic disability and ill health are, by their definition, variable conditions, and therefore it is absurd to expect such people to be fit enough to look for paid employment, only to become too ill to work within a short period of time. Not only would Medical Administrators be able to remove the totally unnecessary distress faced by the innocent victims of this assessment process, but it would also save a great deal of money by greatly reducing the numbers of people going to these AH assessments and, hence, reduce the numbers of Appeal Tribunals. Any increases in salary costs will be negated by the very significant savings from the reduced costs of tribunals and appeals, as well as the reduced requirement for continued reassessment in many cases. It would also remove the distress now faced by this vulnerable community. The DWP can then either cancel this fatally flawed disability assessment contract with AH, or introduce a generous compensation scheme. There are now many thousands of genuine chronically sick and/or seriously disabled victims of this DWP funded medical tyranny, masquerading as medical assessments, as conducted by Atos Healthcare following guidance by Unum Insurance, formerly known as the totally discredited American corporate giant Unum Provident Insurance. Costs can't be the only concern in any civilized society. Care, concern and compassion must be returned to the UK to arrest tyranny, using foreign companies, against those least able to find social justice. 5000 disabled people and carers didn't march in London for no reason, and it's time someone listened to them. (9)  Decision making and appeals in the benefit system. The Daily Telegraph – 2nd February 2008. Mark Daly, presenter: US-based multi-national insurance giant, Unum, has shown a keen interest in UK welfare reform since the mid 1990s. This is Unum's HQ in Portland in Maine. Unum are the world's largest disability insurers, with more than 25 million customers in the US alone. But in 2002, a series of whistle blowers came forward with damning allegations. Linda Nee was a claims handler for UnumProvident, as it was called then. Linda Nee: I was often placed in the position by a consultant, who was my supervisor, of denying a claim. Of telling me to deny a claim, or having a manager tell me to remove documentation from a claim so that an attorney would not have an opportunity to see it. Mark Daly, presenter: It was alleged that UnumProvident cheats tens of thousands of disabled Americans out of their rightful benefit claims. Many of them came from California. Joan Hangarter had her own business before falling ill.
Joan Hangarter: An impartial, unanimous jury of 12 people found that Unum had wrongfully terminated my benefits. They had lied, they had cheated, they had misrepresented the facts. Peter Dewis, Unum Customer Services: I think the important thing to recognise is that those issues that were found in relation to the US claims management practices now belong to history. They were critically reviewed when the regulatory findings came out, a number of very important changes have been made. In the UK we reviewed all of our claims management practices and found ourselves not to be wanting in relation to anything that the US regulators were saying. Mark Daly, presenter: But, there are still dozens of bad faith cases and allegations outstanding against the company on both sides of the Atlantic. Despite all of this Unum had senior executives sitting on key government working groups last year, and has provided detailed memorandum on transforming the benefits system. The government also awarded grants worth £300,000 to Unum's research centre in Cardiff. Ian Gibson MP: I think the government should have them in front of them in an open scrutiny process in Parliament, and we should ask them what their game is. Why it happened in the States first, could not happen here if they have still got the same philosophy. There is some indication now that they haven't changed that much. The leopard hasn't changed it's spots. Mark Daly, presenter: The BBC has discovered internal documents revealing that Unum believes it is driving Government policy. The Department for Work and Pensions refused to comment on Unum's past. A spokesman said: "Throughout the process of developing our policies.. Ministers and officials have met and spoken to hundreds of organisations and individuals like Unum to find out what works." As Unum attempt to leave its chequered past behind, the debate over UK welfare reform will rage on. Unum Provident has been renamed as UNUM. The DWP published on their website a document named "Transformation of the Personal Capability Assessment" dated September 2006. The document was located on the DWP website with location "http://www.dwp.gov.uk/docs/tpca.pdf". The document is no longer available at this location. A copy of the original DWP document is available http://www.whywaitforever.com/dwpatos-tpca.pdf. 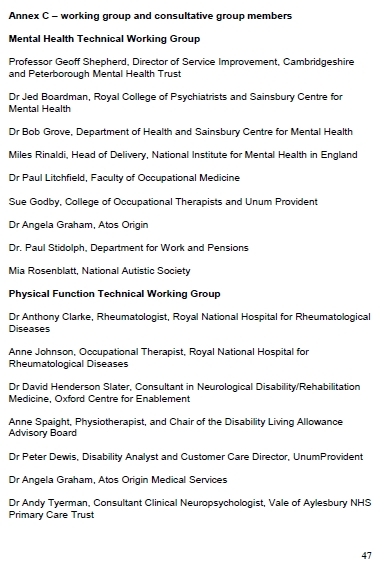 Page 47 of this document "Annex C - working group and consultative group members" shows that both UNUM and Atos advised the DWP in both the "Mental Health Technical Working Group" and the "Physical Function Technical Working Group". Technical working groups usually work on the fine details of implementation and operations. UNUM may have other technical expertise but it is infamous for its expertise in implementing and operating what was called by lawyers in the USA "Disability Denial Factories". The individuals from UNUM are Sue Goodby and Dr Peter Dewis. The individuals from Atos are Dr Angela Graham. It is believed that the original document can still be obtained from the DWP using a formal Freedom Of Information request. This document has been moved to http://www.whywaitforever.com/dwpatosveteransreport20111205.html". This document has been moved to http://www.whywaitforever.com/dwpatosveteransreport20111120.html". It has taken considerable correspondence to produce the research published here and to try why this is allowed to happen. Due to the volume of correspondence it is necessary to collate by year.